The goal of BikeArlington is "to build bike culture and make it easy for people to incorporate biking into their everyday lives." They do great work getting more people on bikes in Arlington by holding bike commuting seminars, sponsoring bicycle safety classes, hosting events, and talking to employers, employees, and residents about the benefits of bicycling. They are looking for an Events and Outreach Coordinator. This would be a great job for someone who loves bicycling and wants to see more people using bikes to get around Northern Virginia. See the job announcement. Bikesharing in DC is having a major impact on the number of people choosing to travel by bike. For many DC residents, using Capital Bikeshare is an affordable way to have access to a bicycle without worrying about maintenance or bike security. When I rode to the District last week the majority of people I saw riding were on CaBi bikes. Virginia Report - BikeShare Rolls into the Region - July 2011 from Comcast Channel 28 on Vimeo. 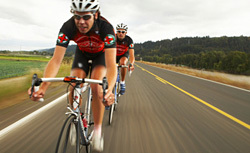 FCDOT and VDOT are developing new bike lane projects as part of the 2011 summer repaving program. Routes under consideration include: Soapstone Drive, Sleepy Hollow Road, Lewinsville Road, Sully Park Drive, and Route 123 (Dolly Madison Drive). Plans for Gallows Road Phase II Bike Lanes, funded by 2007 County Bonds, were finalized and construction is anticipated in late 2011. 150 new bicycle racks and 30 new bicycle lockers were purchased and are currently being installed countywide. In coordination with Comstock Partners, FCDOT is designing a "state of the industry" secure bicycle parking room at the proposed Reston-Wiehle Ave. Station including 200 spaces, bicycle retail use, and future bicycle sharing. Stringfellow Road Park-and-Ride Lot expansion is under design, including secure, covered bicycle parking for over 100 bikes and enhanced trail and sidewalk connections. Fairfax County bicycle parking guidelines, standards, and specifications will be released soon, providing guidance to developers and government agencies. 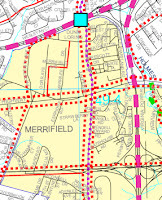 Phase I focuses on the greater Tysons area including segments of McLean, Merrifield, and Vienna, and will go before the PC and BOS in late 2011. Phase II will encompass the rest of Fairfax County. Work began in April 2011, with a study duration of 18 months. One mile of paved, 10-foot wide shared use path from Wharton Lane to Stringfellow Road, providing access to the expanded Stringfellow Road Park-and-Ride Lot. 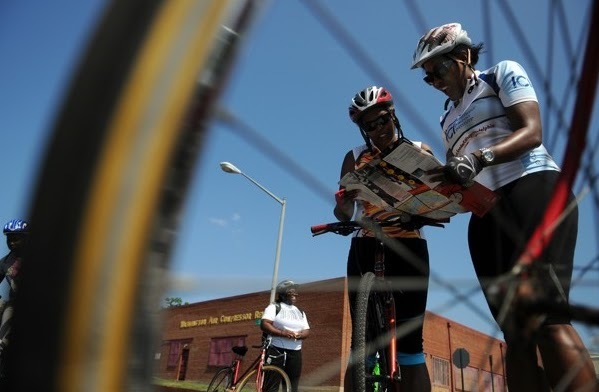 FCDOT is creating a family-friendly bicycle route map centered around historic sites in the western area of the County. Funded with a Federal Transportation Enhancement grant, the project is scheduled for completion in 2011. FCDOT, with private sector and County agencies, continues to sponsor the region's "Bike to Work Day" with nine pit stop locations within the County. FABB is one of several bike organizations included in a Vienna Patch article by Tim Fricker of bikes@vienna entitled Who Speaks For Cyclists?. Also included are the Vienna Bicycle Advisory Committee, WABA (FABB's parent organization), Virginia Bicycling Federation, and the League of American Bicyclists. FABB is a sponsored project of WABA and we encourage our supporters to become members of WABA and to donate directly to FABB. The Environment Committee of the Fairfax Co Plannning Commission will meet on the same night as the Gallows Rd/Rt 29 meeting to discuss the Green Building Policy that was adopted in 2007. The meeting is Wed. the 27th from 7-9 p.m. in the Board Auditorium, Fairfax County Government Center, 12000 Government Center Parkway, Fairfax, VA 22035. Policy e. Encourage energy conservation through the provision of measures which support nonmotorized transportation, such as the provision of showers and lockers for employees and the provision of bicycle parking facilities for employment, retail and multifamily residential uses. While it's encouraging that bicycling is included in the policy, LEED specifications for bicycle facilities are inadequate in our opinion. We discussed this in an earlier post on bike parking at VDOT headquarters. The building is LEED-certified but has wave racks located 300 feet from the building entrance. Fortunately VDOT has agreed to provide inverted U racks adjacent to two building entrances for visitors and employees. We sent comments to the Planning Commission asking for more detailed bike recommendations in the green building policy. Fortunately a final draft bike of the county's parking guidelines have been released and we hope the become county policy this year. The meeting on Wednesday is a "pardon our dust" meeting. Public hearings for this project occurred several years ago after study by a task force, before FABB was formed. Around that time we recall being told by a member of the Transportation Advisory Commission, currently a Planning Commissioner, that "those bikers" wanted too much, despite the fact that the Trails Plan contained the above recommendations. Looks like we didn't get much either. Gallows Road is a major north-south connector for all modes of transportation, and a 10 foot shared-use path isn't sufficient to serve the pedestrian and bike traffic expected in this area. The 5 and 6 foot sidewalks along Route 29 are even worse. Given the late stage of this project, it's not very likely these plans will change. We plan to attend the meeting on Wednesday. Update July 26—We've learned that wide outside lanes are included on Gallows Road. Bike lanes were proposed but they are not included in the final configuration. Wide outside or "wide curb" lanes work well for many cyclists although most people who are reluctant to ride in traffic would much prefer striped bike lanes. Bike lanes are currently striped on Gallows from the W&OD Trail to the bridge over I-66 just north of Dunn Loring Metro. Later this year bike lanes will be striped from the W&OD Trail north to Tysons. Over the past week or so a team from Toole Design Group have been asking users of the W&OD Trail to fill out a survey. We've seen them at the Belmont Ridge and Hunter Mill Rd trail crossings. According to NVRPA, Toole is conducting a safety study of several intersections along the trail that includes field measurements, video monitoring, and survey questions. Other trail intersections include Columbia Pike, Lee Hwy, Wiehle Ave, and Sterling Blvd. We'll be interested in seeing the results of the study. If you see the survey crew, why not stop and fill out the survey form to let them know what you think about the intersection. Trail Mix is a series of events on September 3, the Saturday of Labor Day weekend, celebrating the W&OD Trail. The Greater Washington Sports Alliance, Northern Virginia Regional Park Authority and Dominion Virginia Power are sponsoring the event. The events include Hail the Trail, a Trail Cleanup and Beautification project, The Great Skedaddle, a Bike, Run, Walk Event, and Trailfest, a Community Festival. The bike portion of the event has two options, 5 and 10 miles. We're a little concerned that participants are urged to "Use it as a training day for an upcoming race." When we talked to organizers a while back we warned them that the Trail is very crowded on weekends and training on the trail is not a good idea. Tour organizers are looking for volunteers so if you want to help, contact ebraner@gwsportsalliance.com. "Course will start and finish at Farmwell Station Middle School, host venue of Trailfest." It's amazing how much publicity was given to the closing of a highway for a few days in California last weekend. Dubbed "carmageddon," you would think a major catastrophe was going to occur when I-405 was closed for a couple of days for construction. As it turns out it was "much ado about nothing." When I learned the actual distance Jet Blue's planes will fly—30-odd miles—I wondered if there might be a faster (and even cheaper) way. Jet Blue had posted a flight time of 20 minutes. But what happens when you factor in the time to and from the airport on both ends, the walk to the check-in and then the unpredictable security lines, the equally capricious runway departure and arrival queues, and any other unforeseen delays? That cross-town trip was theoretically adding up to a substantial schlep. Cyclists will depart from a residence near the intersection of Cahuenga and Chandler Blvd. in North Hollywood at 10:55 AM PT (Saturday, July 16) Flight Departs 12:20pm and we're basing the cyclists' departure time on the airline's recommended passenger arrival time of 1.50 hours before departure. (we're doing a little less to be fair)Cyclists will be required to follow all traffic laws.The finish line is the light house at the Shoreline Aquatic Park in Long Beach (adjacent to Acquarium of the Pacific)Ezra and I will take a cab from LGB to the finish line courtesy of GaryRidesBikes FIRST TO ARRIVE AT THE LIGHT HOUSE WINS! We're trying to find out how much of the $70 M is devoted to bicycle improvements. In only 13 of the 46 crashes in 2011 was the driver determined to be at fault (28%). Cyclists were said to be at fault in nearly 60% of the crashes. 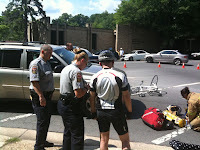 In only 4 of the 27 crashes in which the cyclist was at fault were charges filed. 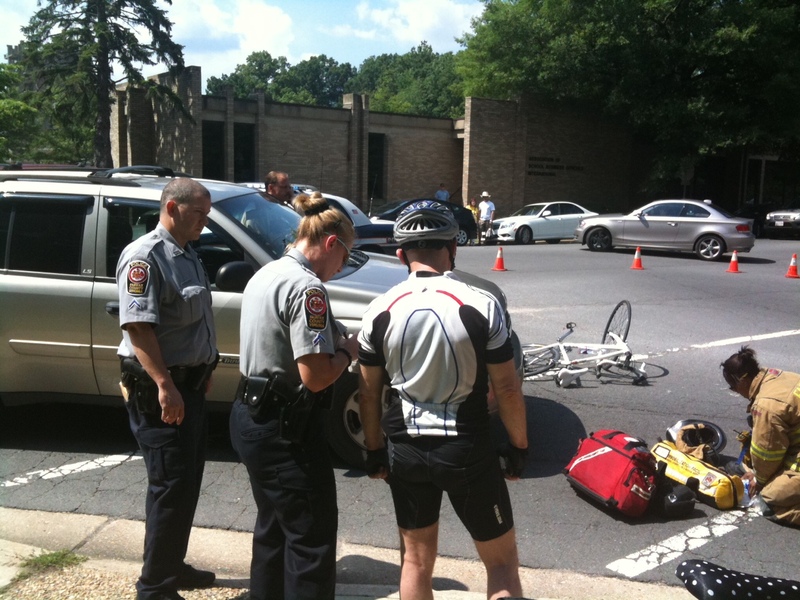 From some reason the report released by police contained this section: "Fairfax County had an estimated 2,176 reportable crashes in the first quarter of 2011.Crashes involving bicycles in this same period represent less than 1% of this total." We're not sure why "represents less than 1% of this total" is highlighted. For one thing, many bike/car crashes go under reported because they involve less than $1,000 in damage or there were no serious injuries. I would guess that a much higher percentage of auto crashes are reported than bike crashes. The page on which the crashes were reported also contains the poorly produced safety video we critiqued earlier. Construction is underway on the northern section of the Cross County Trail (CCT), located near the Dulles Toll Road and Browns Mill Road in the Difficult Run Stream Valley Park in Dranesville. As a result, the section of the CCT under the Dulles Toll Road will be closed to all traffic now through August 2011. The contractor, Southern Asphalt of Lorton, VA has mobilized at the site and will continue work throughout the summer. Construction of approximately 400 feet of concrete trail under the Dulles Toll Road bridges and the repair of an adjacent natural surface trail are planned. This Fairfax County Park Authority capital project will provide significant improvements to this section of the popular 42- mile trail. Funding for this $106,000 project was provided through voter-approved, park bonds. In addition, the Dulles Transit Partners are nearing completion of the Silver Line Bridge over the Difficult Run. Remaining work includes bridge deck work, which may make passage under the bridge hazardous. It is anticipated that work on the bridge will take an additional two to three months. Park patrons should expect periodic closings of the trail under the Dulles Toll Road now through the month of September as work is completed. For your safety, please observe all posted signage. Construction access to the site is from the existing trail and parking area along Browns Mill Road. Trail users will see additional stone material and construction equipment on the trail. As a safety precaution, portions of the existing trail between the Dulles Toll Road and Browns Mill Road may be closed occasionally during the project. For more information contact Project Manager Thomas McFarland at 703-324-8688. See our earlier blog posts about construction at this location. As we noted in our earlier post, Bicycle master plan kickoff meeting, Fairfax County recently began development of the first-ever bicycle master plan. The presentation from the first Bicycle Advisory Committee meeting on June 28 is now online. We seek a broad range of public and private transportation choices for our Region which maximizes accessibility and affordability to everyone and minimizes reliance upon single occupancy use of the automobile. We seek a transportation system that maximizes community connectivity and walkability, and minimizes ecological harm to the Region and world beyond. It's not surprising that the road lobby was upset that a more ambitious road building plan wasn't included in the recommendations. According to NVTA, "Greater Washington 2050’s Region Forward draft ignores both these realities in endorsing a totally inadequate transportation strategy focused exclusively on public transit, bicycles, sidewalks and land use." When MWCOG and its 21 local governments individually endorsed Region Forward and its Greater Washington 2050 Compact in 2010, the road lobby got serious. Some of the largest developers in the region, including Til Hazel, formed the 2030 Group to push for the outer beltway, a new bridge across the Potomac to Montgomery County, and other sprawl inducing transportation projects. The 2030 Group then funded a survey of '45 unnamed "transportation experts"' to define transportation priorities in the region. See the GGW post Surprise surprise: "experts" picked by road lobbyists put road building at top of priority list and Coalition for Smarter Growth's press release Contrived Survey is Latest Effort to Promote Costly and Ineffective Outer Beltways. In this environment, building more roads and transit without addressing development patterns is a recipe for failure. The Wall Street Journal recently reported on a study finding that expanding roads in metropolitan areas increases traffic after just a few years. An outer beltway would not relieve traffic, but like most new beltways, it would spark development in undeveloped rural areas. We need to use our scarce resources, first, to fix potholed roads, crumbling bridges and our aging Metro system and, second, to create a more energy-efficient land-use and transportation system. If we don’t offer alternatives to so much driving, then high oil prices will keep eroding family finances and threaten our economic and national security. High gas prices and changing demographics — young workers and downsizing empty-nesters and retirees — are increasing demand for more walkable, convenient and transit-accessible locations. Build a network of transit-oriented communities. A network of walkable, mixed-use, compact neighborhoods at Metro and commuter rail stations will be far more cost-effective than merely adding transportation capacity. Reinvent commercial strip corridors. Redevelop thousands of acres of parking lots and one-story buildings as part of that network. Address the east-west jobs divide. Locate employment at 15 Metro stations in Prince George’s County; Wheaton and Glenmont in eastern Montgomery County; and Route 1 in Prince William and Fairfax counties. Locate homes in or near major job centers. For example in Tysons Corner, the Red Line/Interstate 270 corridor and Loudoun’s Route 28 corridor. Locate jobs in centers with transit and mixed uses. Maximize peak-hour transit trips on rail, buses, vanpools and carpools, and take advantage of reverse commute opportunities. Enhance neighborhood accessibility. Invest in walking and bicycling routes to schools, libraries, stores and parks, creating alternatives to driving on traffic-choked arterial roads. Fix major commuter corridors. Simply widening corridors such as I-66, I-95, I-270 and Route 5 will fuel more-distant development and even longer commutes. Focus on express buses with dedicated lanes, combined with zoning to manage development in outer areas. Finish Dulles Rail and the Purple Line. Tie them to well-designed development and add Purple Line crossings of the Potomac at both ends of the Beltway. Commuter rail. Invest in VRE, MARC and Amtrak. If we can accomplish these tasks, our future will include more transportation choices and more convenient access to work, school and services. Major cuts to transportation funding are being proposed in Congress. According to WABA, in the latest draft of the transportation bill "Representative John Mica, Chair of the House Transportation Committee, cuts funding by 30% for all our nation’s transportation needs, and it lands a knock-out punch on the Safe Routes to School program by eliminating it entirely. All bike and pedestrian projects are essentially shut down thanks to this draft’s focus on auto-centric road projects and a mere suggestion, not a minimum baseline, that transportation dollars be spent on bike and pedestrian projects as set in the previous transportation bill." In the Senate, Senator Inhofe wants to eliminate all funding for these programs. Just last week he said that eliminating these investments is one of his top three priorities for the entire transportation bill—even though bicycling and walking funding makes up just 1.5% of all transportation spending, and 12% of all transportation trips. Please support dedicated funding for biking and walking in the next transportation authorization bill. Bicycling and walking are not partisan issues. They are increasingly popular and cost-effective modes of transportation. Each year, more and more people walk or bike, over 4 billion bicycle trips to work, school, transit or shops. For many people in America, walking and bicycling is the only form of transportation available to them because they are too young, too old or too poor to drive their own car. For other Americans, the health and environmental reasons are compelling. But, as bicyclists and pedestrians, we face significant safety risks every time we step out the door because so many communities lack basic infrastructure like bike lanes, trails, crosswalks and even sidewalks. In fact 2/3 of pedestrian deaths occur on the federal aid highway system. Programs like Transportation Enhancements, Safe Routes to School and the Recreational Trails program have provided critical dollars that help America’s communities install this much-needed bicycle and pedestrian infrastructure to ensure that biking and walking can be done safely. Furthermore, these projects create jobs and build local economies. Bicycle and pedestrian infrastructure creates 46% more jobs than building a road project per million dollars. But now, Senator Inhofe wants to eliminate all funding for these programs. Just last week he said that eliminating these investments is one of his top three priorities for the entire transportation bill—even though bicycling and walking funding makes up just 1.5% of all transportation spending, and 12% of all transportation trips. I implore you to contact Senators Boxer and Inhofe to let them know that you support continuing dedicated funding for bicycling and walking. Please stand up for Transportation Enhancements, Safe Routes to School and Recreational Trails. I look forward to hearing back from you about your position and actions. Thank you for standing up for me on this important issue. Black Women Bike has attracted women with varied interests and skill levels — from triathletes, to women who are returning after years away from cycling, to women who don’t even own bikes yet. About 20 of the women recently got together for a happy hour at the Liaison Lounge on Capitol Hill. "We talked about equipment, we talked about fears of riding in the road. And we talked about hair," said Washington, 33, a federal government analyst. "There always seems to be an attack on black women — we're not attractive or we don't exercise. We are dispelling myths about black women. We are carving out our own niche. Who said riding a bike had to be a white thing?" "We're spending half a million dollars a year funding the Northern Virginia Bicycle Association to promote tourism. Now I have to ask some of you business owners out there; do you think someone riding a bicycle on the W&OD Trail is going to help your business? That our county is spending half a million dollars to encourage people to bicycle into the county." Northern Virginia Bicycle Association? We're checking with the Volpe campaign to find out more about the association and the half million dollars being spend on bicycle tourism. I think owners of restaurants and stores in Ashburn, Leesburg, Purcellville, and other places along the W&OD Trail might say that yes, cyclists do spend money in Loudoun County and we'd like to have more of them come here. Employers such as Orbital Sciences, AOL, and others would say that they encourage their employees to travel by bike for their health and to reduce congestion. give Scott Smith the key to a bicycle locker. Scott Smith never has to search for a parking spot at the Sunset Hills Park and Ride in Reston, which often is almost full to its capacity of 600 cars. He knows he can wheel directly to his reserved parking space next to the bus stop, and he can leave his vehicle under cover, sheltered from the elements. Scott is not a VIP with special privileges. Thanks to a Bike to Work Day promotion set up by Fairfax Advocates for Better Bicycling (FABB), for the next year Scott has free use of one of the 20 bike lockers at the park and ride lot. FABB member Kerie Hitt is part of the organizing committee for Reston's Bike to Work Day event and thought up the idea of raffling the use of a bike locker to promote bicycle transportation. Kerie said, "I realized that many people don't even know what a bike locker is, let alone that we have lockers practically right next to Reston Town Center, along the W&OD trail. Since Reston has the largest Bike to Work Day event in Fairfax County, I thought a drawing would be a good way to raise awareness about the lockers and the transportation options they offer." Having a bike locker at the park and ride allows bike riders to string together car/bike trips or bus/bike trips. All county Connector buses are equipped with bike carriers. Combining bike travel with other modes can help bicyclists go farther distances and get to places they might not be able to access solely by bike. Every time a person travels by bike, traffic congestion is eased somewhat. 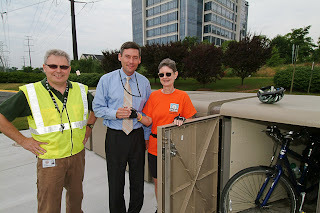 Kerie mentioned her idea to staff at the Fairfax County bicycle program, the office that administers the lockers. Almost immediately they decided to support the drawing and offered to waive the usual fees involved in securing a locker. The Reston Town Center Association agreed to cover the key deposit. On the morning of Bike to Work Day on May 20, several dozen people entered the drawing, and Scott's name was selected as the winner. After the necessary paperwork was completed, Kerie and Fairfax County bicycle program manager Charlie Strunk presented Scott with the key to his locker a few weeks later. At that time in mid June, several other lockers still were available for rent at the Sunset Hills Park and Ride, at 2050 Sunset Hills Road. Fairfax County also manages bike lockers at the Herndon-Monroe Park and Ride on Sunrise Valley Drive and the Reston South Park and Ride on Reston Parkway. The usual yearly rental fee is $60 with a one-time administrative fee of $10 and a key deposit of $50. For more information about renting a bicycle locker, go online to the Fairfax County Bicycle Locker Rental Program at http://www.fairfaxcounty.gov/fcdot/bike/bikelockers.htm or call the bike program office at 703-324-BIKE (2453). Notwithstanding any other provision of law, if a driver of a motorcycle or moped or a bicycle rider approaches an intersection that is controlled by a traffic light, the driver or rider may proceed through the intersection on a steady red light only if the driver or rider (i) comes to a full and complete stop at the intersection for two complete cycles of the traffic light or for two minutes, whichever is shorter, (ii) exercises due care as provided by law, (iii) otherwise treats the traffic control device as a stop sign, (iv) determines that it is safe to proceed, and (v) yields the right of way to the driver of any vehicle approaching on such other highway from either direction. While most of his teammates are fighting the morning rush, veteran midfielder Clyde Simms hops onto his gray Trek hybrid bike, makes two turns, crosses two streets, passes through one traffic signal, whizzes past the D.C. Armory and dips into Lot 5. "Door to door," he said, "I’ve done it in about two minutes." "I'll smoke him," Pontius said. "He's got a one-speed bike," Simms replied.